This page introduces some tips on how to make a product canvas so as to visualize the product plan for a product manager in the planning stage. 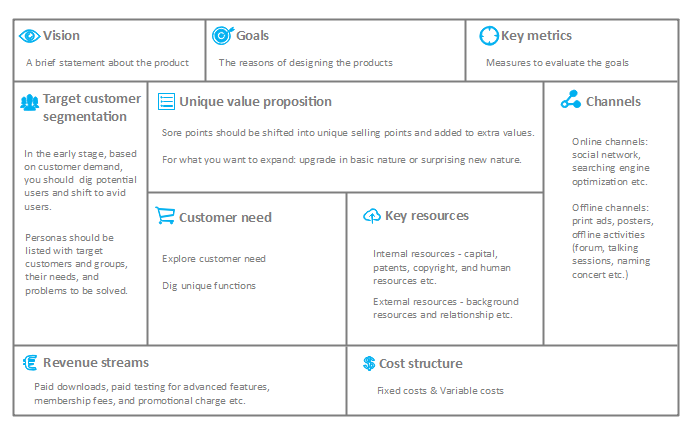 The product canvas is a powerful tool in product planning which helps you create products with great user experience (abbreviated as UX) and reasonable features. It is one of the best solutions in designing a product during product management process. The product canvas is a fundamental tool for a product manager to define the prototype. Before making a product canvas, I highly recommend you to focus on some tips on product planning. 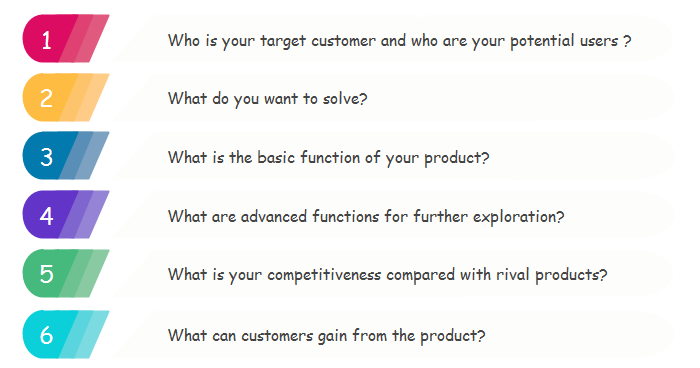 To get a well-organized product plan, ask the following questions initially. There are two logics in analyzing product model which are marketing logic and financial logic respectively. 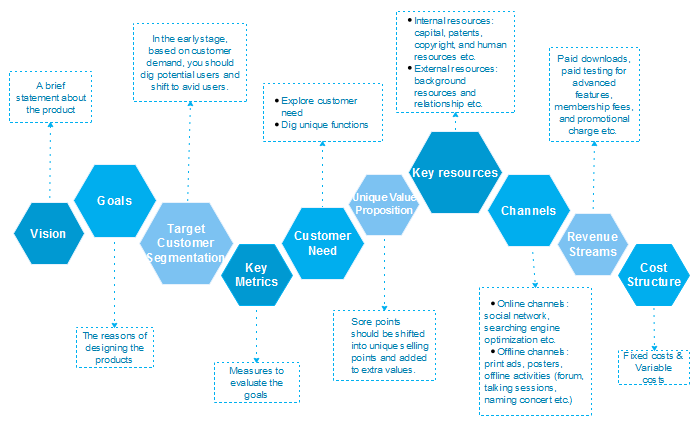 The aim of the product canvas is to combine two logics and integrate the whole process to make the product more comprehensively. As for marketing logic of a product, the product manager will evaluate what is the business relation. And considerations like what is the sore point of target users and how to solve will contribute to a better understanding of potential users demand. Therefore, for the financial logic, issues like the development of a product, profits, operational efficiency are concerned which influences the prospect of a product. Ultimately, the product canvas combines two logics and integrate to an intuitive graph. Although the prototype of a product has not been put forward, you still need to imagine what it will influence some groups of target customers. 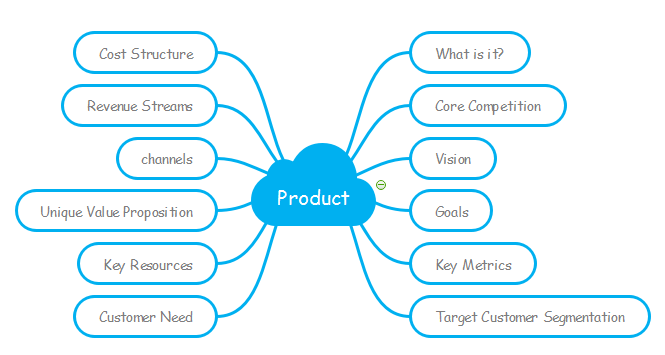 Goals of a product show the expected results a product manager intends to achieve and indicate the reasons of designing product. Key metrics can be come out to determine and measure whether the goals are achieved or not. In the early period of product management, target customer segmentation is of vital significance as it will offer orientation service of target customers to form them into an avid user of the product. A qualified product manager should dig customer needs to explore the unique functions so as to occupy a dominant position in the competitive market. Reasons of customers choosing the product is a difficulty for a product manager. In this period, a product manager should shift sore points into unique value proposition and add extra value for customers. The unique value proposition comes from not only upgrade in basic nature of the products but also surprising nature. Key resources of a product can be divided into two parts internal resources and external resources. Internal resources contains capital, patents, copyright, and human resources while external resources tend to be background resources and relationship etc. Online and offline channels are equal importance to be closed to your target customers. Online channels target more on social media and searching engine optimization while offline channels involve print ads, some activities like holding a forum and talking sessions to spread direct to your potential users closely. Revenue streams embody several parts including paid downloads, paid testing for advanced features, membership fees, and promotional charge etc. Cost structure is made up of fixed cost and variable cost. Questions like “What does the most expensive cost derive from?” should be considered in advance so as to control the costs. Next, I will use Edraw - Best Product Canvas Maker Software to instruct you how to make a product canvas. Step 1 - Prepare a product sketch in your mind. If you are a product manager, you should think over what type of product you intend to plan and prepare a product sketch containing elements of product canvas in your mind for further extension. Step 2 - Set the layout of the overall structure of a product canvas. Step 3 - Fill the canvas by adding elements. Customize what you insert conveniently with the following operations - rotate, fill, size,align style and layer etc. 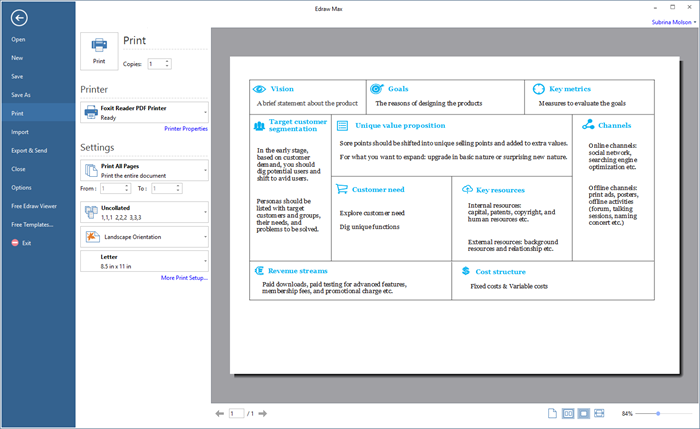 Step 4 - Export, share and print the product canvas. After finishing making the product canvas, you can export and save it to various formats such as JPG, PDF, office file, SVG, Visio etc. Share function together with cloud storage contributes to collaboration and cooperation in teamwork . You can access your work and collaborate with team mates whenever and wherever you need to discuss with them. Now, I guess you cannot wait to make a product canvas with Edraw diagramming software. Get a free trial now.